Well of course the big event on Saturday was the Anthony Awards. I managed to lose gracefully to the very sweet and funny Julie Hyzy’s culinary mystery State of the Onion but I’m still bitter over losing Best Cover to Girl with the Dragon Tattoo. 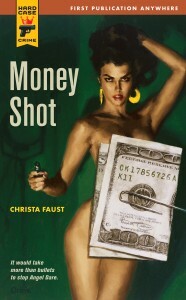 I mean, really, it’s not a bad cover, but better than Money Shot? I think not. Later than night, the Reacher party at the amusingly named Slippery Noodle. Very cool place with a live blues band, but way too loud for me, since I was already well on my way to developing the inevitable b-con Wolfman Jack voice. I tapped out after about twenty minutes, but not before having a chance to meet and shout briefly at Jason Pinter. But the really memorable moment that night was sighting the astounding and now legendary Chicken Limo!